A picture tells a thousand words, hence, I have drawn a rough draft with my lousy drawing, haha, just to give an idea of what I have roughly visualise, but of course, pls let me know from your professional perspective, what is feasible or not, and just do in your best professional judgement what you think is best for the final product! 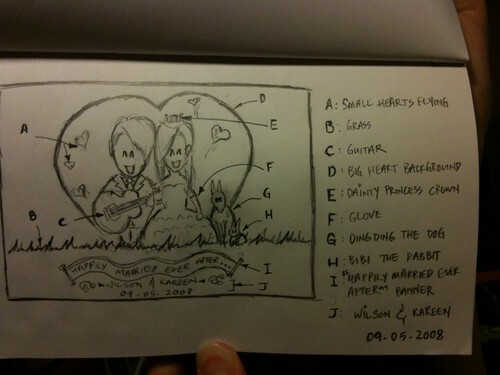 Pls see my attached files, with various photos of me and my wife, and also the draft i've drawn. Timeline-swise, I'd need to get it by 30th Sept! 1. Can you advise me, the difference between "Caricature in Ink & Brush with Theme" and "Caricature in marker with Theme"? Frankly, I prefer very much the strokes you use in "Ink & brush" compared to "Marker", though the only downside is it is in black and white, cos I prefer in color, nicer! Which would you suggest? 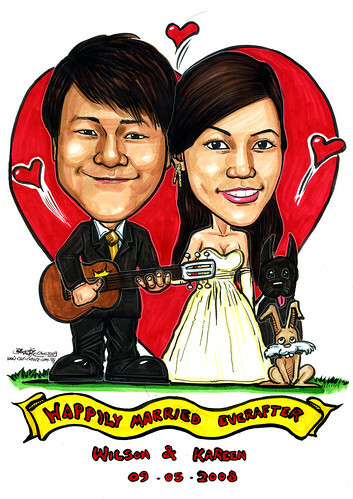 Also, when you draw with markers, it looks quite different compared to those you sketch in live events, where I saw the excellent caricatures you did for the Teachers' Day dinner at Pan Pac and the Standard Chartered Bank event... how can I achieve a caricature with that live event style + theme, and yet with colours? Is it because you used marker colors to show the facial details, compared to using lighter lines just in black and white, and hence the different feel when I look at both types? Which would you recommend? 2. Pls refer to pictures of my dog and rabbit to get an idea of what colors to paint them in! 3. 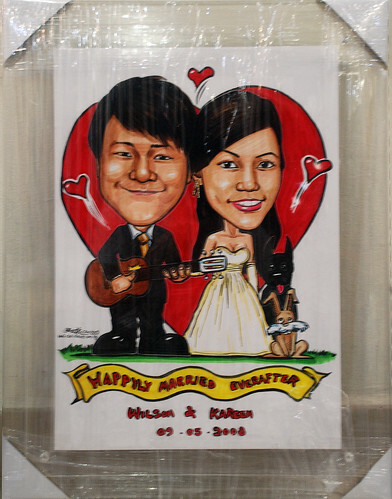 Also, pls quote me the pricing to mount the final caricature on the sleek acrylic frame shown in the sample of the caricature you did for IPM-Asia. I would like to display the mounted caricature outside my wedding lunch reception, and perhaps even another duplicate for guests to sign their name on! For me; I seldom smile showing my teeth, haha, only found a couple precious pics of that, just for you to get an impression of how I look smiling showing teeth! And dun use my ROM hairstyle, looks horrid... just draw my normal hairdo.. "
Drawn according to his draft. Turned out to be something different from my usual style of drawing. "Hi, my wife loves the caricature, thx!"